Stanley Kubrick's rarely seen debut feature tells the story of a war waged (in the present? in the future?) between two forces. In the midst of the conflict, a plane carrying four soldiers crashes behind enemy lines. From here out, it is kill or be killed: a female hostage is taken on account of being a potential informer; an enemy general and his aide are discovered during a scouting mission... What lies in store for this ragtag group of killers, between their perilous landing in the forest, and the final raft-float downstream... all this constitutes the tale of Kubrick's precocious entry into feature filmmaking. 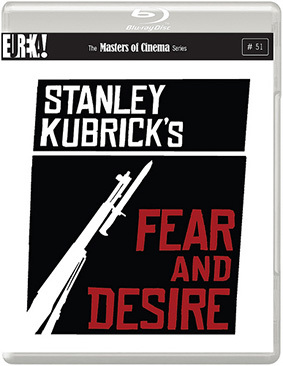 Independently financed with contributions from Stanley Kubrick's family and friends in an era when an "independent cinema" was still far from the norm, Fear and Desire first saw release in 1953 at the Guild Theater in New York, thanks to the enterprising distributor Joseph Burstyn. Now, with this new restoration carried out in 2012 by The Library of Congress, a film that for decades has remained nearly impossible to see will at last appear in a proper release in the United Kingdom. Bringing into focus for the first time the same thematic concerns that would obsess the director in such masterworks as Paths of Glory, Dr. Strangelove, and Full Metal Jacket, Fear and Desire marks the outset of the dazzling career and near-complete artistic freedom which to this day remains unparalleled in the annals of Hollywood history. Fear and Desire will be released for the first time ever on DVD and Blu-ray in the UK from Eureka as part of the Masters of Cinema series at the RRP of £18.37 for the DVD and £20.42 for the Blu-ray.